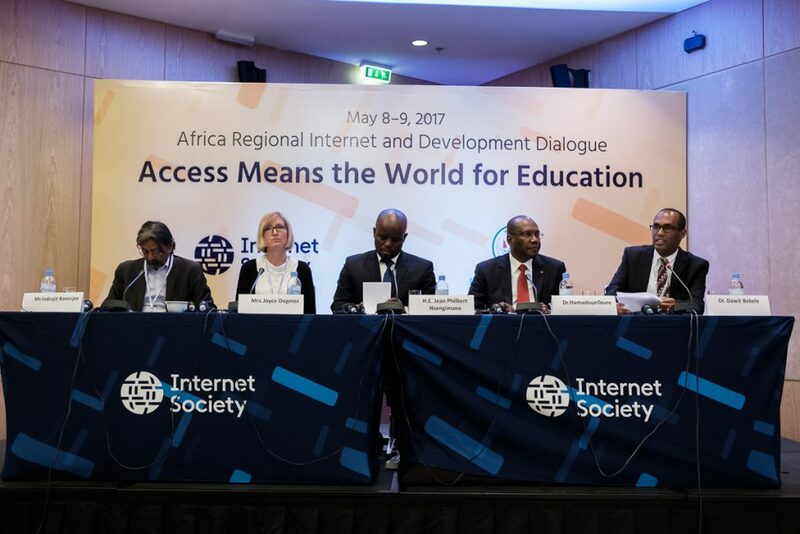 The first ever Africa Regional Internet and Development Dialogue was successfully held from 8-9 May in Kigali, Rwanda, in partnership with UNESCO and Republic of Rwanda Ministry of Youth and ICT. The event gathered 161 high level local and foreign experts from various organizations including AFRINIC, WACREN, UBUNTUNET, ASREN, ECOWAS, UNECA, AUC, African Universities etc. Africa is one of the largest continents of the world with abundant resources that are key to its economic growth. However, despite of its natural and human resources, the continent remains to be faced with considerable development challenges. Today, Africa stands at a crossroad. New opportunities are rising ahead. Through creating an enabling environment, Africa can bring a much-needed economic transformation and development if it uses these opportunities. The Internet brings new development opportunities for Africa. The opportunities for an African economic breakthrough through the Internet are real and within reach. The democratization of entrepreneurship and innovation can open tremendous opportunities to African countries. But is Africa using these Internet of opportunities? Recently, there have been some encouraging signs of some African countries building their Internet infrastructure and creating a real economy around the Internet. Some of these countries are already reaping the benefits of the Internet economy. They are also using the Internet to transform all aspects of their economic, social and political lives but a lot still remains to be done. The Africa Regional Internet and Development Dialogue will be hosted by Internet Society (ISOC) and the Ministry of Youth and ICT of the Republic of Rwanda. UNESCO is also a partner of the meeting. The event will also be held few days before Transform Africa Summit 2017. This is expected to elevate its overall value, ensuring high level participation from the region and beyond. Find the event’s agenda, recording of the event livestream and event photos here. The availability of locally relevant content is increasingly seen as a limiting factor in the widespread adoption of the Internet in emerging regions such as sub-Saharan Africa. This report reviews the potential implications of Information and Communication Technologies (ICTs) in general, and the Internet in particular, for education in Africa. The vision of the Internet Society is that the Internet is for everyone, everywhere, and to help achieve this aim we have conducted a number of studies of barriers to connectivity in emerging regions. This report continues in that vein, but represents a shift from examining the barriers to accessing content.